Polignac - thanoscardgamess jimdo page! This is a suite of two point-trick taking card games, Polignac and Knaves. The game of Polignac was known in France since XIX century. The name was given after a hatred minster of Charles X, named Polignac. It is played by 4 players without trumps. 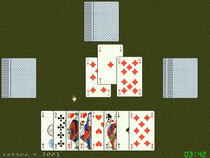 Each player tries to avoid taking any jacks in tricks. A deck of 32 cards is used. Players receive 8 cards. In each suit, the cards rank: K (high), Q, J, A , 10, 9, 8, 7 (low). In the game of Knaves, a full deck of 52 cards is used and 3 players receive 13 cards and play with trumps. The object here is to avoid getting jacks and trying to get as much tricks as possible.